$25 Pure Design Online/Kids Gift Certificate (GC25) at Pure Design / Accessories / Gift Certificates ::: Furniture for the Home, Office, Home Office, and More at Pure Design Online! 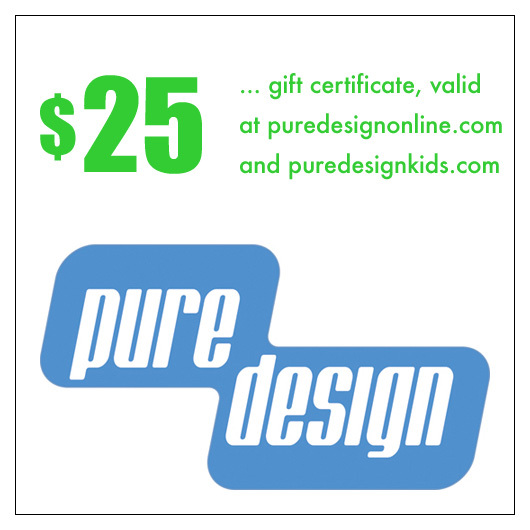 A $25 gift certificate that can be used on either Pure Design Online (puredesignonline.com) or Pure Design Kids (puredesignkids.com). Also valid on discount "basement" items (basement.puredesignonline.com). No restrictions on use. Gift certificates can be ordered -- and easily redeeemed -- in multiples (i.e. 3 of $25, for a total of $75), but they'll all be sent to a single recipient ... you'll need to check out multiple times if you wish to send these to multiple recipients. At checkout, you'll be able to enter the recipient's name, email address and a personal message.